Habitat for Humanity Day of Service! 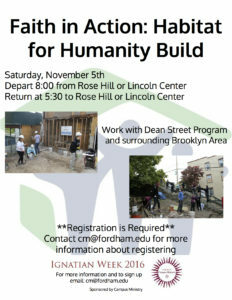 Be part of a Fordham tradition that includes over 700 Rams through our partnership with Habitat for Humanity! Vans will depart from both Rose Hill and Lincoln Center to support the Dean Street Project and surrounding community in Brooklyn. All members of the Fordham community are welcome. Detailed information Found Here. Join Fr. 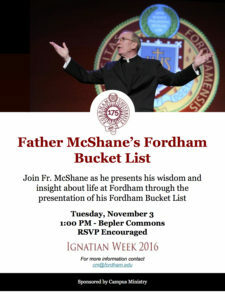 McShane as he presents his wisdom and insight about life at Fordham through the presentation of his Fordham Bucket List. 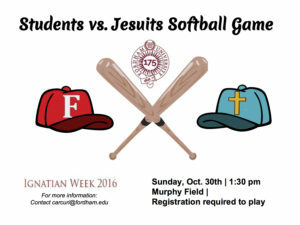 Students vs. Jesuits Softball Game! 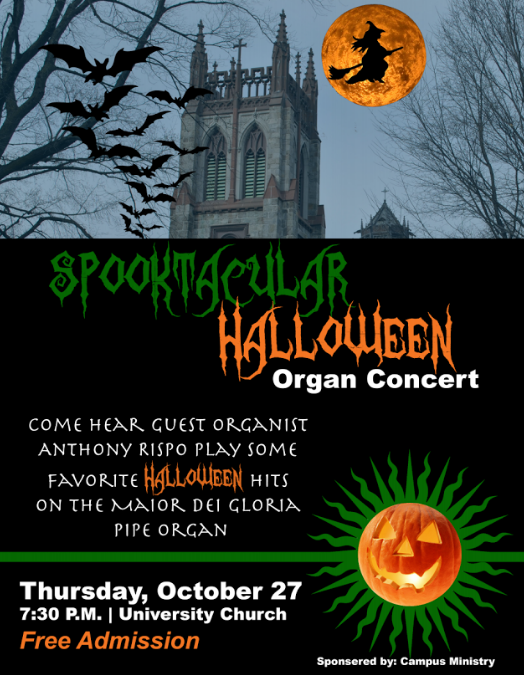 Come hear guest organist Anthony Rispo play some of your favorite Halloween hits on the Maior Dei Gloria pipe organ in the University Church on Thursday, October 27 at 7:30 PM! Free admission. Lincoln Center – Lowenstein Plaza under the Mission and Ministry board and Room 140, 140 W. 62nd St.
All gifts, no matter the amount, are meaningful and greatly appreciated. Sponsored by Campus Ministry and the Dorothy Day Center for Service and Justice.